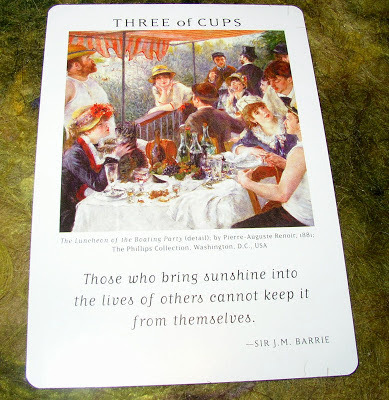 Today's Draw: Three of Cups from the Art of Life Tarot. When you do things for others, does it make you happy yourself? What little bits of sunshine do you like to sprinkle in the lives of others? What can you do in the next day or so to make others smile? Of course, the easiest way to bring sunshine into someone's life is to simply flash them a smile. There are many studies that prove just the act of smiling alone can make you happier. In one that I found from Scientific American, they actually injected botox into women's faces to make it impossible for them to frown. Turns out the women who couldn't frown were happier than the ones who could...haha. There are also studies that support the idea that smiling is contagious (you can find links to these studies on my blog.) So put the two together and your smile makes you happy, it has a tendency to make others smile back, and that makes them happy. So Sir J.M. Barrie's quote can be proven correct. I think anytime we give something of ourselves we create the possibility for a similar loop of happiness. A couple of months back Ciro Marchetti developed a new Lenormand deck and hid his initials in every illustration. I have no doubt doing that gave him the giggles. And people are having fun finding all the hidden gems. In fact, the Luncheon of the Boating Party (which I always thought was called The Launching of the Boating Party!) is an example of this kind of fun, too. Renior had a habit of including his friends in his paintings and the lady in the foreground making kissy face with the dog would become his future wife. Of course it must have been fun for all the people pictured and all who knew them, but 100 years later it's a fun piece of trivia to know. This isn't just an iconic painting, it's a slice of Renoir's life...a gift of himself for the ages. That's how I feel about crafting. I'd much rather have something homemade than store bought. Handmade items contain "the sunshine of others". So all this begs the question...what can you do to bring sunshine into the lives of others, and to yourself? Yes, you can smile, but what else? What other little piece of yourself can you put into your day? And it doesn't even have to be a piece of yourself. It can be a jar of candy on your desk at the office or bringing in a special coffee blend for the coffee maker. What sunshine can you bring to yourself and others today/tomorrow?